Sinn Fein Dáil Leader Caoimhghín Ó Caolain TD and national Chairperson Mary Lou McDonald will this afternoon launch the party’s An Chéad Dáil Éireann Commemorative Pack which is being sent to primary schools throughout the country. 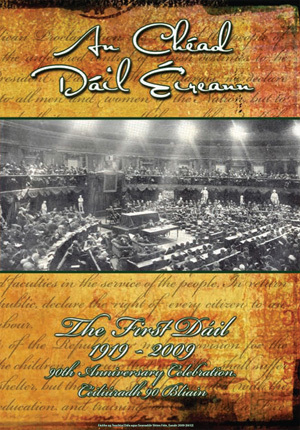 The pack includes a commemorative 20 page illustrated brochure which details the historic events leading up to the first Dáil and will also contain reproductions of the documents adopted by TDs on January 21st 1919. “Modern Ireland faces many challenges. Working families face heavy financial burdens, the vulnerable remain insufficiently protected, the economy is under developed and border counties continue to carry the economic and social burden of partition. “Equality was the basis of the Democratic Programme adopted by the first Dáil. The Programme set out progressive social and economic goals based on the principles of the 1916 Proclamation and articulated by Pádraig Mac Piarais and James Connolly.